1. Flower of the sea. 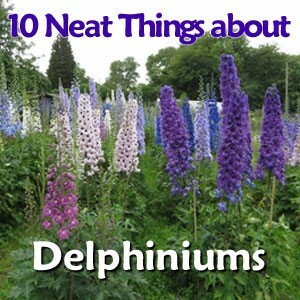 Named by the Greeks for the loveliest creature of the sea, the word delphinium comes from the Greek delphis, for dolphin. Larkspur, a variety of delphinium, was so called by the British because they believed its flower resembled the claw of a lark. Delphinium elatum, the common garden variety delphinium, is powerfully poisonous, containing an alkaloid called delphinine, which has properties very like those drawn from Aconitum (monkshood), although a bit weaker. Nevertheless, delphinine kills in much the same way, attacking the heart. Prescribed in minute quantities by those who know their art, delphinium has been used to treat dropsy (a weakening of the heart that causes water to build in the body), to treat gout and as a parasiticide. It was used effectively during the First World War to treat lice and their nits in the hair. Juice from delphinium leaves is said to relieve bleeding hemorrhoids and relieve spasmodic asthma. Juice from the flowers was used to relieve colic in babies. 4. Only flower with its own dedicated art show. Edward Steichen (1879 to 1973) was, by day, a fashion photographer for Cond? Nast publications such as Vogue and Vanity Fair, but on his own time, he was a grower of delphiniums. He mounted a show in the Museum of Modern Art in the summer of 1936, showing his seven-foot tall delphiniums. How did he get them that tall? He fed them a cocktail of colchinine (a derivative from the autumn crocus, which is also used to treat gout). Colchinine is a chemical mutagen that promotes chromosome doubling. His delphs were giants of their times and his Delphinium 'Connecticut Yankee', named in honour of Mark Twain, is still available today. Delphinium flowers were ground into powder then mixed with alum to make a very good blue ink. The flowers were also used to make blue dye to colour yarns and other fabrics. Delphiniums are happiest in deep rich soil with even moisture and lots of compost. They are heavy feeders enjoying a diet of compost, fortified by a periodic binge on fertilizer. In spite of all this nourishment, alas, they are short-lived, losing some of their vitality after the second or third year. If they don't self-sow in your garden, re-plant a few each year. You can also take basal cuttings to propagate your favourites. Delphs signify an open heart and ardent attachment. Larkspurs project lightness and swiftness. Delphinium is July's birth flower. 8. The delphinium leaf tier, Polychrysia esmeralda. This golden winged moth infests delphiniums (and monkshood, larkspur and globeflower) by overwintering near the bottom of their hollow stems then emerging to create silken nets of leaves and blossoms. The larvae that they lay then peacefully eat their way into the flower buds, destroying the buds as they do so. Dispose of the worms by hand and cut your delphs to the ground in fall to annihilate their winter home. The most common disease is sclerotinia rot, a fungus that given the chance to mature will turn black before it produces stone-like spores that can drop and remain in the soil for many years. Aster yellows also attack delphiniums. It can turn the leaves yellow and wilts the plant. There are many choices of delphinium, but a few might include the earliest hybrids, 'Blackmore and Langdon', introduced in England in 1905. The flowers are pastel blue, white, lavender, violet and indigo. 'Pacific Coast Giants' are seven feet tall and come in blue and pink. 'Magic Fountains' are only about 30 inches tall. 'Blue Mirror' is gentian blue. 'Green Twist' is creamy white with green overtones. If you love delphiniums, there are delphinium clubs to join and learn from. Try www.ondelphiniums.com.